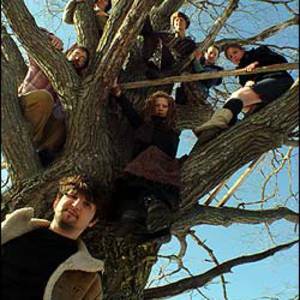 Cloud Cult is an experimental indie rock band from Minneapolis, Minnesota. The band's founder and singer Craig Minowa has a degree in Environmental Science, and his environmental, political, and social awareness is reflected in much of Cloud Cult's music. (Note: Craig Minowa actually has stated he intentionally doesn't sing about environmental awareness because he lives it...he doesn't need to preach it) The band's self-created non-profit record label, Earthology Records, uses the most environmentally friendly methods available to ensure minimum damage to the environment. After two solo LP's, The Shade Project (1995), and Who Killed Puck? (2000), Craig's sudden loss of his two-year-old son and subsequent separation from his wife, Cloud Cult emerged with They Live on the Sun in 2003, combining concepts of Minowa with performances by cellist Sarah young and drummer Dan Greenwood, who shortly became members of the band. This album was deeply personal and painful album for Cloud Cult and you don't often hear songs from it in concert. Craig continued to use music to cope with the loss of his son on the following album Aurora Borealis. This album did begin to branch out more into exploration of pain and loss instead of just feeling it. Craig Minowa reunited with his wife. The next album is widely considered their crowning achievement. Advice From the Happy Hippopotamus involved collaboration from a variety of musicians and has garnered praise from critics, even being acclaimed as "a work of insane genius". This album is capped off with the "happy-go-lucky" song, Lucky Today. This album was selected by esurance to be animated into a commercial. This was a contest for the most environmentally sound band because esurance labels themselves as the paperless insurance provider. On April 10th 2007 they officially released their sixth LP, The Meaning of 8, although it was available for sale online in late January. Their first single from the Meaning Of 8 is titled "Take Your Medicine." In April 2008, the band followed it with Feel Good Ghosts. Their concerts are certainly a sight to be seen. Along with Craig on Guitars (and other fun things), they have got bass, drums, violin and cello. The there are two official band members who actually do very little music during the shows. Craig's wife Connie and Scott are painters. They create original works of art during the show (breaking only occasionally to sing or sometimes Scott plays Trumpet). Then, at the end of the show, they silent auction these paintings off to the highest bidder.